Home and Fabulous: SPLURGE OR SAVE? Have you ever wanted something so badly but thought it was too expensive? Well that's what happened to me when I saw a new lamp that Kate Spade came out with. Have you seen the new home collection? It's to die for! I love anything Kate Spade. I was on the verge of buying it because I liked it so much. It was beautiful. But in that moment that I was browsing through the website, something caught my eye, A PURSE! Those who know me, know that I have an obsession with designer purses (even thought I don't buy them often). But that was my dilemna, the purse or the lamp. Of course in the end I chose the purse and a couple of other things. I got a super cute wallet, some earrings, and some bracelets. After I thought, since I didn't buy it, I have to find a way to recreate this lamp because I was in love with it. First things first I went to HomeGoods to look for something similar. It's good to try and DIY things that are out of your price point so you will still be able to have your house the way you want it without spending a fortune. I like to change up my house often and if I spend a lot of money every time on one thing, then I wouldn't be changing it up as often. Below I'll show you the lamp I found at HomeGoods which is very similar to the Kate Spade version. This is the lamp I found at HomeGoods priced at $79.99. It's tall and looks similar if not exact to the Kate Spade lamp. Now it was time to find a lamp shade in black. If that didn't work out, I was going to do the cheaper option which was paint the lamp shade it came with. I started out by painting the bottom part of the lamp in black. 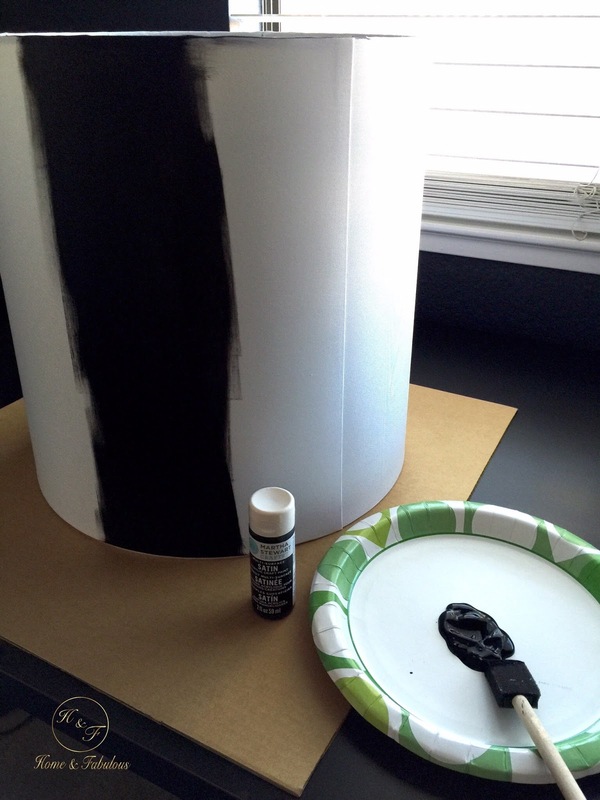 It's good to start the black paint first so you can tape it around after to start on the white paint. I used acrylic spray since the color sticks better. I painted the top part gold just like it showed in the picture. It's best to paint the gold first. I did the black paint and then the gold. The gold started spraying on the black paint so I had to repaint the black part. Next, put blue tape around the lamp were you want the white paint to start and cover the black with paper or newspaper so it doesn't stain. As you can see it's now done. You can see that the lamp wasn't a smooth texture so it was a bit hard for the white line to come out perfectly. Apart from that, the black wasn't getting into all of the texture so when it dried you could still see a bit of the blue peeking out. I decided to paint it with white acrylic paint by Martha Stewart to fill in the spots that needed a touch up. The lamp shade I painted with a sponge brush and acrylic paint. It was very easy because it wasn't a fabric material. It was more like plastic. It came out awesome, just like new!